Today is the Feast of St. Hildegard of Bingen. Quite a remarkable woman. 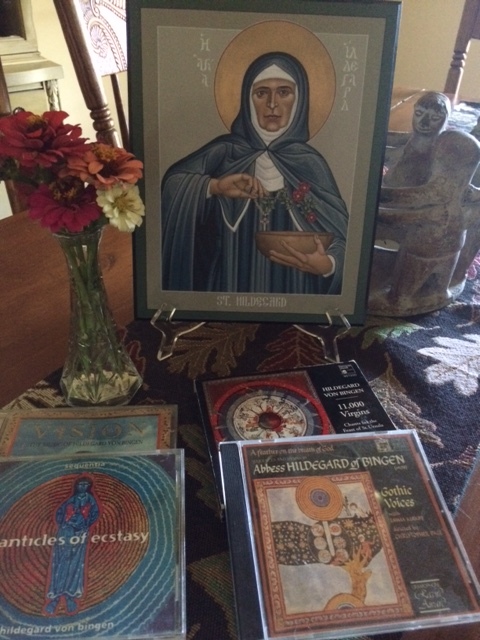 At Joy Fellowship, our Homestead community, we are celebrating Hildegard. We are remembering our life work, her contributions to the church, her music and art. 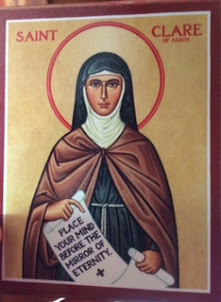 You can read about Hildegard here: https://www.franciscanmedia.org/saint-hildegard-of-bingen and in many other online sources. Most parish churches no longer celebrate the feast days of the Saints, or even high holy days. These days are transferred to Sundays--a time when more of the congregation is present. Or another activity gets planned near the feast. Many churches provide for the Blessing of the Animals near the Feast of Francis of Assisi--it is an add on, so to speak and yet important. I understand the move toward this trend, but I think something gets lost along the way. The call to gather as the faithful community in the midst of life seems to be eclipsed in a call to the masses. It's a sad trend in my mind's eye. If you peruse the internet, you will find many articles written about celebrating these Saints days with children. One such article may be found here: http://www.growchristians.org/2018/09/17/hildegard-of-bingen-a-role-model-for-our-children They provide a wonderful source for continuing formation. But why is it that as we grow, we lose our zest for remember the saints? At Joy Fellowship, we try to take a more adult approach. 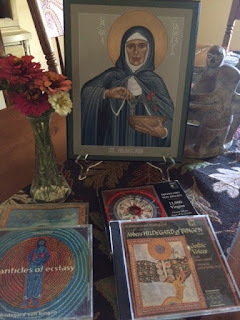 For instance, today, we have an Icon of Hildegard prominently placed on our dining table with a small bunch of the last of our summer zinnas. We will pray her collect at our evening meal and listen to some of her music during our dinner. We will share in a type of cookie that is said to have healing properties and the recipe is attributed to Hildegard herself! Later, we will read from some of her writings together. She is not just a role model for our children, but for our very adult selves, too. For Franciscans, today is also the commemoration of the Stigmata of Francis. We weave this into our conversations by remembering these faithful followers of Jesus. We give a fuller celebration to Francis on his Feast day, October 4. In the waning days of my active parish ministry, I chose Hildegard as the patron of a wellness initiative at the church where I served; I called this move toward wellness Hildegard's medicine. It did not catch on I am sad to say, but I was profoundly impacted by life and her ministry. 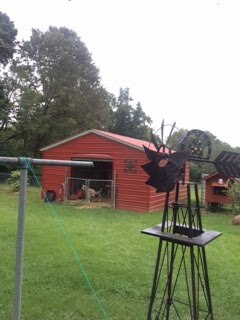 She came to retirement with me, and on Wednesdays on our Facebook page (Joy Fellowship at Almost Paradise Homestead), we devote our space to wellness. My favorite wellness night before I retired was the time we spent learning to belly dance together! It was a small group with a fantastic teacher. We weren't great dancers by any stretch of the imagination; but we were filled with laughter! After all, laughter is the best medicine. Perhaps there is a book in me--a series of reflections on how to celebrate/commemorate these incredible servants of God in our adult lives. It isn't just for children anymore.